Programming the administrative tasks on the Xgig Server should be done quickly and easily. Mitigate technical risk, especially when integrating third-party software into its own enterprise products. Make writing Perl scripts faster and easier. Get a robust, reliable Perl distribution in place that would also be easy to use. Ease of use in writing scripts and running them with the ActivePerl distribution. Ability to focus squarely on building and bettering the core functionality of Finisar testing tools and analyzer technologies. The Xgig development team doesn’t need to worry about managing and maintaining the Perl scripts. Internet video, high-definition television, Voice over Internet Protocol (VoIP), and the exploding growth of enterprise data makes the need for solid, dependable networks more important than ever. Finisar® helps strengthen networks to satisfy these growing demands with components and modules that lay the foundation for fast and reliable high-speed data and telecommunications. Xgig® is Finisar’s industry-leading family of network tools for design and test engineers. They are used to validate network devices during the development phase. By testing products with Xgig tools, device manufacturers can determine whether their chips, switches, network adapters, etc. meet storage protocol and other requirements before they are manufactured. The Xgig testing environment is a combined software/hardware platform. Software runs on a client PC and talks across the network to a hardware chassis, or the Xgig Server. Embedded software running on the Xgig server interfaces the client software to the Xgig hardware. Another task of the embedded software is to manage administrative functions, such as configuring network access by setting up IP addresses and host names. It uses the popular Perl open source dynamic language to run these administrative processes. For instance, the web interface uses several Perl CGI scripts. Perl scripts also run at system start-up and during software upgrades to perform various system configuration tasks. When Finisar began developing Xgig about five years ago, they opted for an enterprise Perl distribution instead of managing Perl in-house. Baxter says they really didn’t give much thought to managing Perl themselves; they were convinced that an off-the-shelf distribution would significantly reduce the amount of time developers would have to spend maintaining Perl packages. Baxter’s goal was to get a robust, reliable Perl distribution in place that would also be easy to use. After evaluating several different enterprise-level Perl distributions, the development team chose ActivePerl by ActiveState. “On a Windows system, ActivePerl is the most well known and widely used distribution. There’s a high degree of confidence in ActivePerl,” said Baxter. 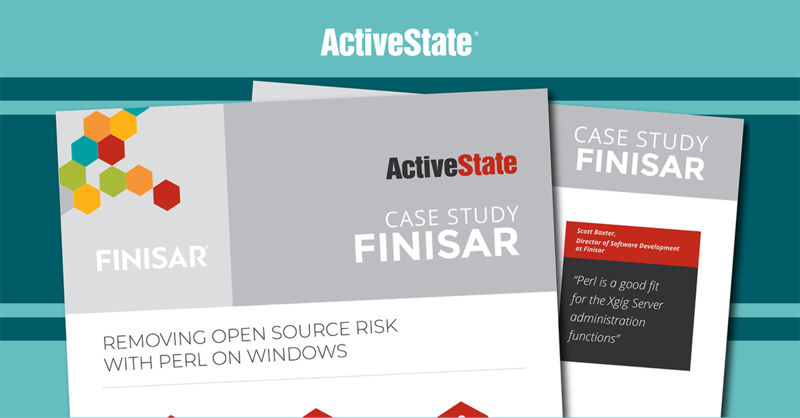 Before selecting ActivePerl, Finisar conducted extensive software quality assurance testing to make sure that ActivePerl would deliver on quality and ease of use. Baxter says there were absolutely no issues in writing new Perl scripts for use within the distribution, which meant programming the administrative tasks on the Xgig Server could be done quickly and easily. “It was the ease of use in writing scripts and running them with the ActivePerl distribution that closed the deal,” he said. All of the Perl scripts running administrative processes on the Xgig Server use the ActivePerl package. As a public company trading on NASDAQ (ticker symbol: FNSR), Finisar takes special care to mitigate technical risk, especially when it integrates third-party software into its own enterprise products. Once technical concerns are put to bed, Finisar’s engineering and legal teams meet to review applicable software licenses. They must ensure third-party software won’t cause licensing and legal headaches. A good way to minimize legal risks is to use third-party technology that’s been broadly adopted and has proven reliable over time. ActivePerl fits the bill; it’s recognized as the de facto, industry-standard Perl distribution. There are currently millions of installations of ActivePerl running worldwide today. Additionally, the version of ActivePerl that Finisar uses–ActivePerl OEM Licensing–comes packaged with out-of-the-box licensing. It’s a shortcut to cost-effective redistribution rights for the fully tested Perl distribution. That means no homework, administration or legal problems for Finisar. When Baxter and his team decided to use an enterprise Perl distribution, they hoped it would make writing Perl scripts faster and easier so they could focus squarely on building and bettering the core functionality of their testing tools and analyzer technologies-protocol analyzers, jammers and pattern generators. That’s exactly what’s happened. Baxter says by using ActiveState’s enterprise Perl distribution, the Xgig development team doesn’t need to worry about managing and maintaining the Perl scripts that run Xgig Server administration functions. “Since the beginning we’ve been very satisfied with the results, and have found ActivePerl to be robust and reliable ever since,” said Baxter.